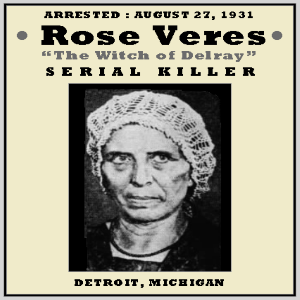 In 1931 there was a mysterious murder at the Detroit boardinghouse of Hungarian immigrant Rose Veres. Amid accusations of witchcraft, Rose and her son Bill were convicted of the brutal killing and suspected in a dozen more. Their cries of innocence went unheeded–until one lawyer, determined to seek justice, took on the case. Join author Karen Dybis as she discusses the twists and turns of this shocking story, revealing the truth of Detroit’s own Hex Woman. Registration at the Adult Service desk or call the library at 734-426-4477.